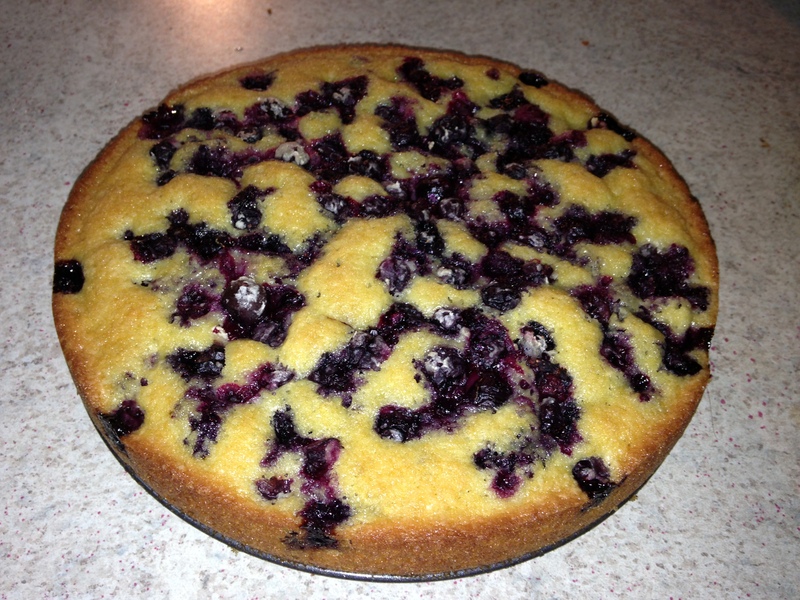 I found a leftover pint of blueberries in my basement refrigerator and decided a blueberry buckle or cake sounded good. 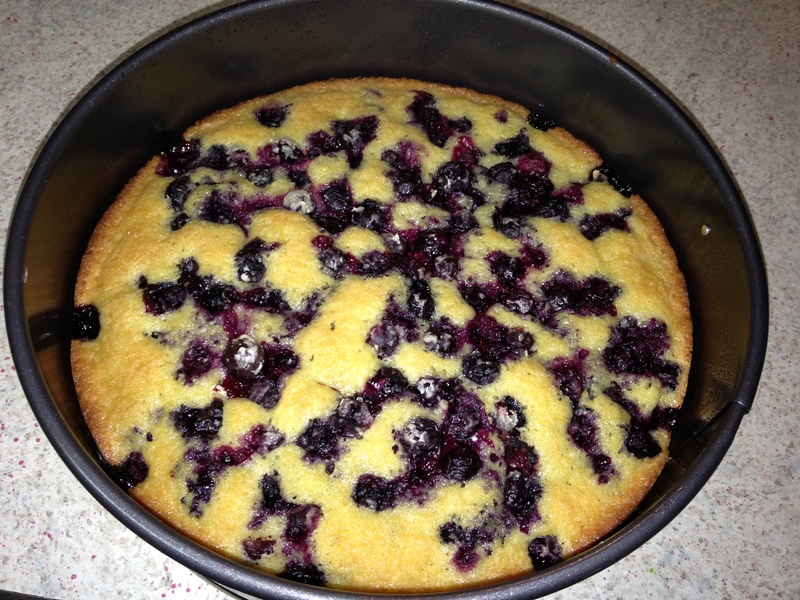 I hopped on to Pinterest, typed in blueberry cake and the first recipe I saw was very easy. 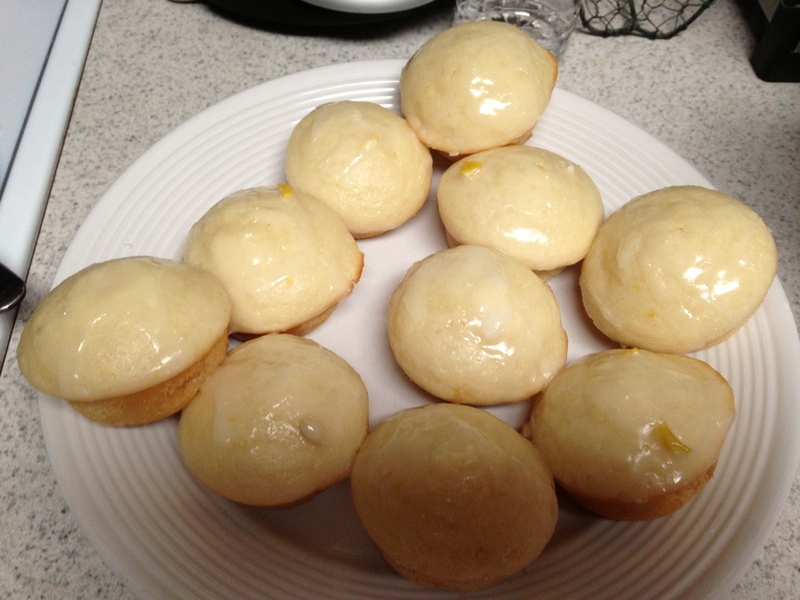 One specific ingredient the recipe called for drew me in……..fresh lemon zest! 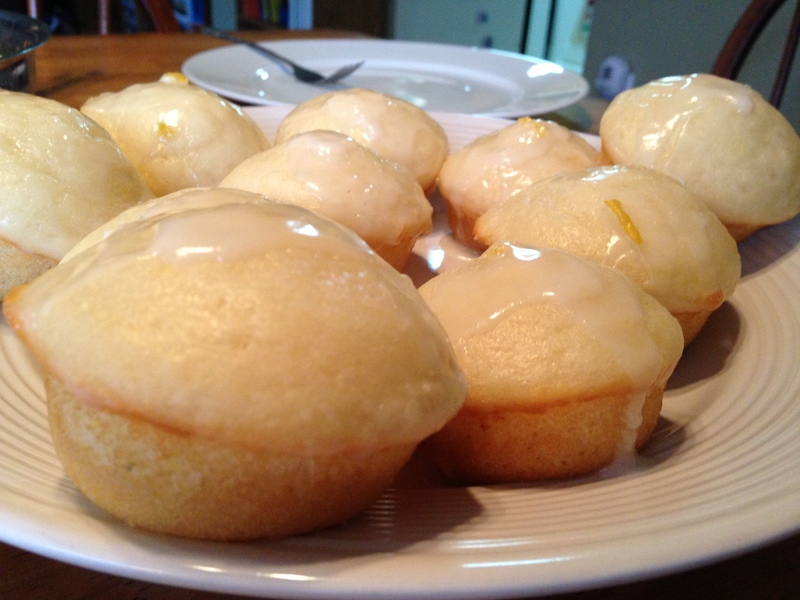 My love affair with lemons convinced me this was the cake to make! The recipe also called for the use of a spring-form pan, which I specifically bought a few months back to make cheesecake in. I haven’t used it since then, so this clinched the fact that I needed to make this cake just to get more use out of my pan! Of course, I used my Bosch to mix the cake in. It only took a few minutes to make and tasted delicious. Preheat oven to 350F or 175C. Lightly grease and flour the 9″ spring pan or pie pan. Combine 1C flour with baking powder and salt. Set aside. Using a mixer, beat butter and sugar on medium high speed for 2 minutes. Add the eggs one at a time and beat until light and fluffy, about 2 more minutes. Add vanilla and lemon zest. Reduce the speed to low and slowly add the flour mixture, beating until smooth. Pour the batter into the pan. Combine the berries with the 1t flour and the lemon juice in a bowl. 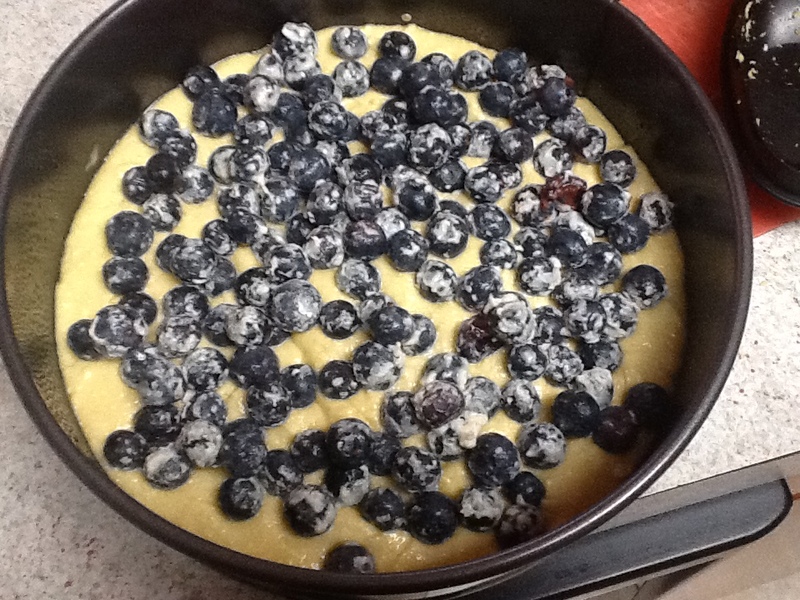 Spoon the berries over the batter. Bake for 45-60minutes or until the toothpick inserted into the center comes out clean. Remove form the oven and let it cool in the pan for 10 minutes. Carefully slide a thin knife around the edges of the cake to release it form the pan. Transfer the cake to a platter. Dust the cake with powdered sugar before serving. I have three sizes of spring-form pans and thought the 9″ was too big. The batter didn’t even fill half of the pan. But, it did rise and somewhat filled the pan. Maybe next time I will try it in my smaller pan, but I don’t think it really mattered. Fresh, out of the oven, served with whipped cream equals one cake eaten in about 15 minutes! I went to the local produce store a couple of weeks ago and they had strawberries for .99 a quart! They looked and smelled delicious! I bought about 4 quarts because, as a family, we can finish off one quart at dinner! A couple of days later, I noticed we still had a quart in the fridge that really needed used up. It got shoved towards the back of my messy refrigerator and that’s why they weren’t gone! 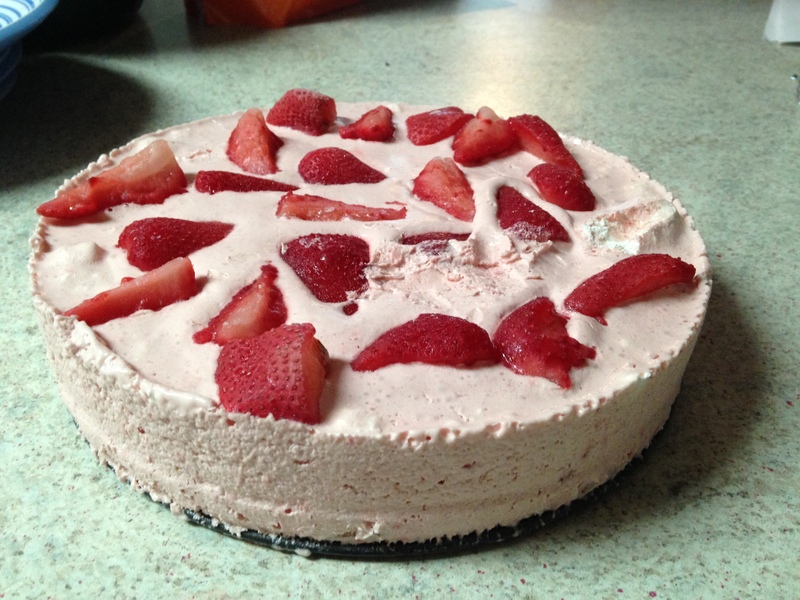 I decided to look up a recipe using strawberries and found this delicious strawberry cake. 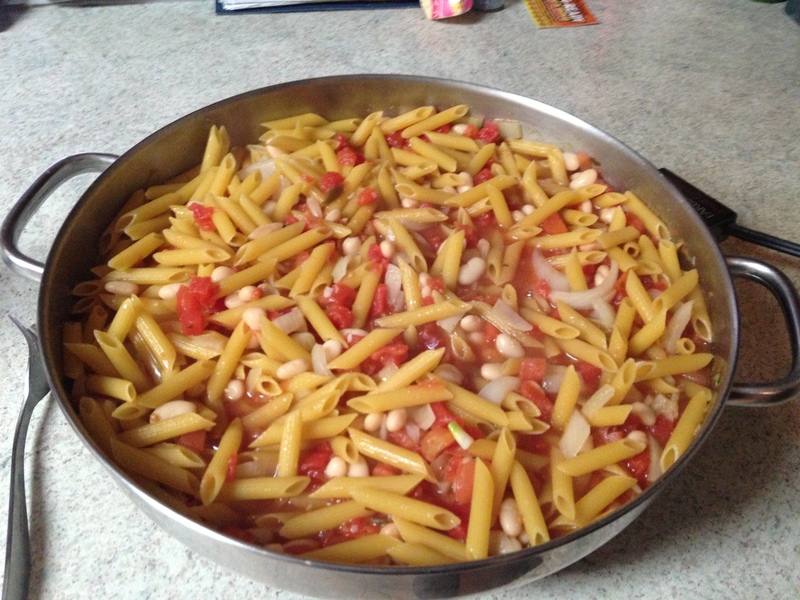 It was really easy to make and really good to eat! 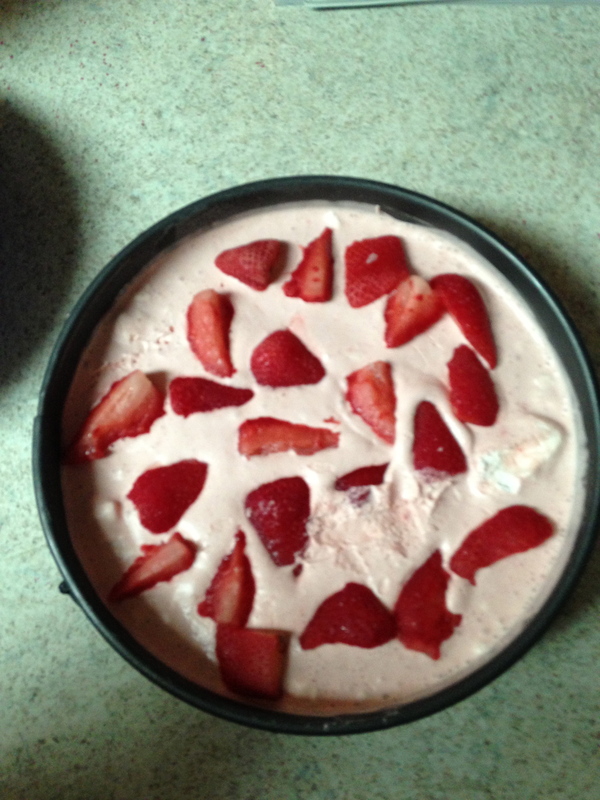 You place cut up strawberries on top of the cake batter and bake them right along with the cake! It baked beautifully and tasted great with whipped cream on top! Of course, the cake was gone in one sitting! I have been craving another one of these cakes, but didn’t find any good strawberries. I bought blueberries yesterday. I wonder if I could substitute the blueberries. I may have to try it and let you know! Since I am not back on track with meals from this past week, I was trying to figure out what to make today that was easy and took very little ingredients that I actually had in my cupboard. Then I had a great idea! Over the past week we had lots of food brought in for us as we were rehearsing, getting ready for the play and while it was running. One day we had various soups and salads. 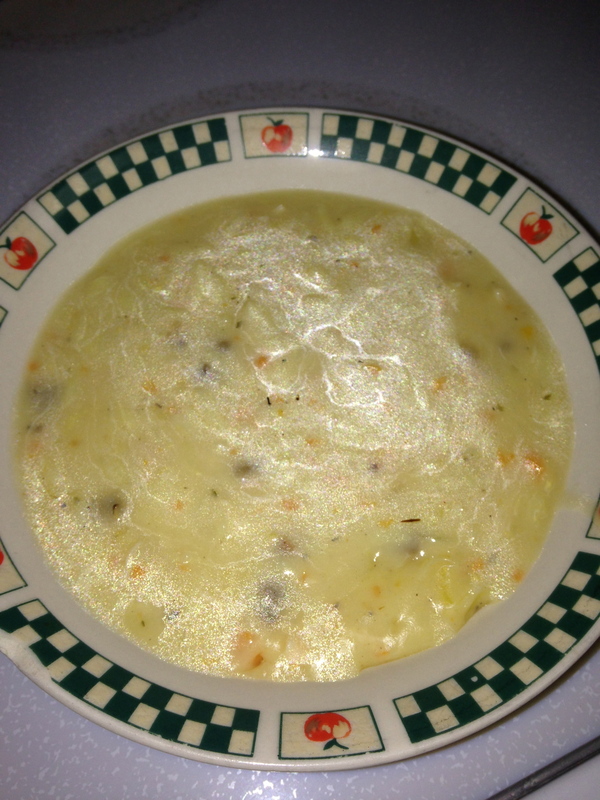 There I discovered one of the best soups! I went back for seconds and it was gone, so others must have thought it was good too! I asked and found out who made it and she gave me the simple recipe. I looked and also found one on Pinterest that was similar, so looked through my cupboards and found I had all the ingredients! Start cooking the rice before you begin working on the rest of the soup. I usually get the “quick cook” kind, but if you get regular wild rice, it will take a while before it is ready! Chop up carrots, onions and celery. Saute carrots, celery and onion in butter until tender. Add flour. Add broth, salt and pepper (I just put a pinch of each in – you probably don’t even really need salt). Bring to a boil. Add chicken and half and half and reheat, but don’t boil again. Add rice right before serving (if you put it in a long time before serving, the rice will keep cooking and get mushy). I hope you try it out! You’ll find out how delicious it is!! It makes 12, but I left 2 in the pan for my daughter after ballet. The finished product. It looks burnt, but the topping is only caramelized. Hi there! Hope your day is going well! It is 60 degrees and rainy here in Michigan on December 4th! I’m not complaining about it! I am quite fine with the day! My day has been completely filled again! Today is co-op day for the oldest and I am the registrar for it, and today is registration for next semester. I then got a call for my 12 year old to attend a ballet class today for a couple of hours about 1/2 hour away, piano classes at 1:15-2:15 at my house (have I mentioned that having piano at the house is the BEST thing?) and then pick up my oldest from co-op and drive my 12 year old to her normal ballet class the opposite direction from the other class! Sometime in there dinner will be made….actually I’m getting ready to pre-make the potatoes and the tenderloin was already pre-made and froze until ready for use! How convenient! This recipe for the pork tenderloin is very, very good! I made it a couple of months ago and ran out, went out and bought another huge tenderloin, and divided it in three and mixed the marinade in the bag and froze them for a later date. All I do then is take it out of the freezer to thaw the night before and then plop it on the grill to cook! It is one of my husband and my favorites! To make the balsamic-rosemary marinade, in a food processor, combine the vinegar, olive oil, soy sauce, brown sugar and pepper and pulse until blended. With the motor running, drop the rosemary and garlic through the feed tube and continue to process until fairly smooth. Place the tenderloins in a nonreactive dish and pour the marinade over them. 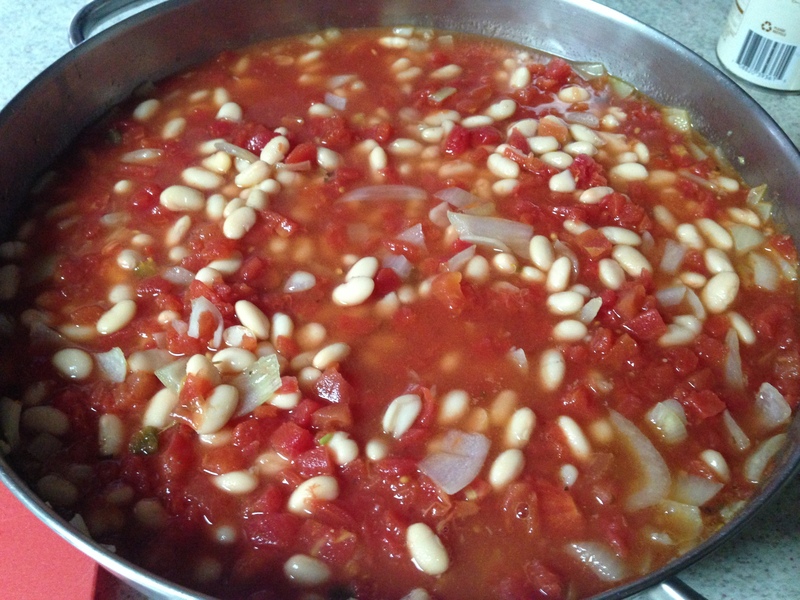 Cover and let stand at room temperature, turning occasionally, for up to 2 hours. Prepare a charcoal or gas grill for direct grilling over medium-high heat. Remove the tenderloins from the marinade, reserving the marinade. Well, my dinner is all made! I made some glazed baby carrots and everything is ready to be warmed up for my husband when he gets home from work! Wow! What a couple of weeks it has been! We are done with both Nutcrackers! It is bitter-sweet. Both shows were spectacular! All the girls were amazing and beautiful dancers! I feel like it has been a whirlwind, a fun one, but a whirlwind, none the less! We now have our weekends back and I’m not sure what to do!! I’m sure they will fill up quickly! 🙂 I haven’t been posting for a couple of days so I thought I would share a recipe I found that I would like to give a try. If you try it let me know how you liked it. 1) Sift the dry ingredients. 2) Add the egg and milk and stir well. 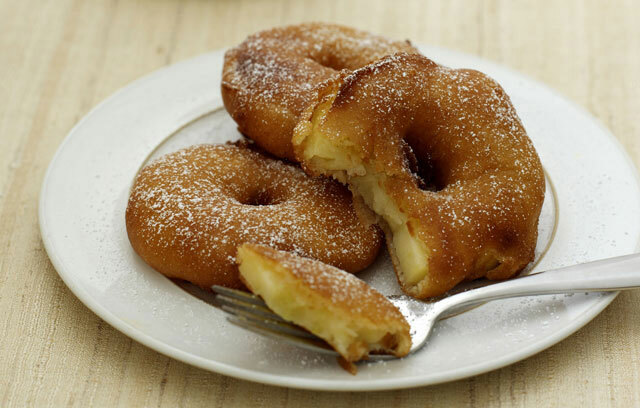 4) Dip the rings in the batter and drop into a skillet containing about 1/2 inch of hot, melted shortening.